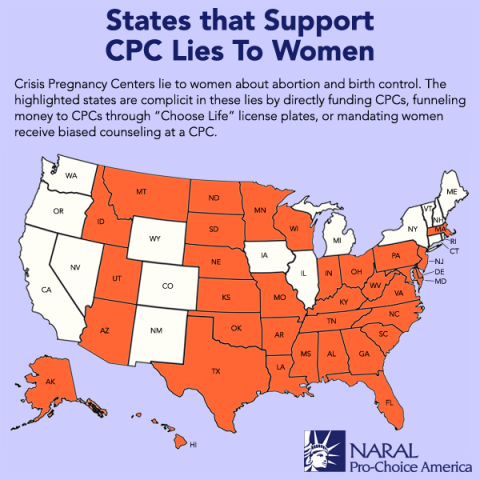 It is no secret that crisis pregnancy centers lie to women. But what many Americans may not know is that, in 34 states across the country, these antiabortion centers are able to stay in business thanks to funding from taxpayers. While some states funnel family planning funds directly to these centers, others require women to seek counseling and mandatory ultrasounds at these facilities before obtaining an abortion. Some states, like Virginia, sell "Choose Life" license plates and send the proceeds directly to these antiabortion groups. While the funding strategies may change from place to place, one thing remains consistent: 34 state governments across the country are using taxpayer dollars to support groups that use lies and medical misinformation to keep women from obtaining safe abortion care.